Ivory Coast will take time to digest their latest African Nations Cup failure before making any decision on the future of their ‘golden generation’, coach Francois Zahoui has said. The Ivorians, packed with high profile players, have been favourites at every tournament since 2006 but again came up short in their bid on Sunday to add to their only previous success 20 years ago. A penalty miss by Didier Drogba in the final in the Gabon capital and squandered kicks in the shootout by Kolo Toure and Gervinho – all three of whom play in the English Premier League – saw them beaten for the second time in the final since their loss in 2006 to Egypt. In 2008 they were semi-finalists and at the last tournament in Angola in 2010 surprise losers in the quarter-finals. Eight players in Sunday’s final had been in the squad defeated six years ago and the Ivorians have turned out a consistent side that has qualified for the last two World Cups. But key players like Drogba, Didier Zokora and Kolo Toure might now consider ending their international careers, even though the coach believes it might not yet be the time. “If they still have the motivation they can still play an important role for the team,” added Zahoui. 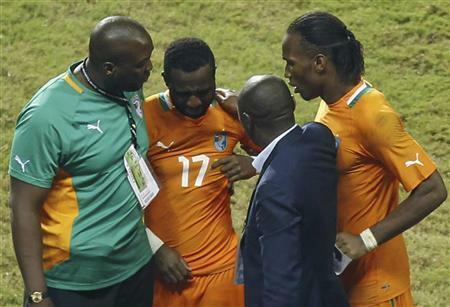 The Ivorians completed the 2012 finals, co-hosted by Equatorial Guinea and Gabon, without conceding a goal in six games but put in a timid performance in the final, seemingly finding the burden of expectation too heavy to carry.